The Tuscan Archipelago is made up of seven islands, Elba being the biggest. Although this island is famous worldwide for having Napoleon in 1814 during his exile, its history goes back a lot further. 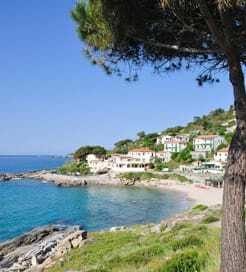 Although Elba is rich in history, it is also famous for having beautiful beaches and crystal clear blue sea. Combine this with its rich landscape and it really is a fantastic destination. Being an Island in the Mediterranean, Elba is of course very simple to reach by ferry. Ferries depart from the port of Piombino on the mainland, incidentally the point where Italy is closest to the island and dock at Cavo and Rio Marina on Elba’s north eastern side and Portoferraio on the northern side. There are hundreds of crossings every week with sailing durations ranging from 30 to 60 minutes, depending on route and the ferry company that you sail with. At certain times of year it’s also possible to island hop from Corsica. There are numerous Napoleonic sites worth visiting like the former emperors residences at Villa dei Mulini and Villa San Martino and the Museum of the Church of the Misericordia where Napoleons death mask is kept. Families, meanwhile, will enjoy the Aquarium of Elba, which is located in Marina de Campo on the South West of the island and showcases some of the finest marine life in the Mediterranean. 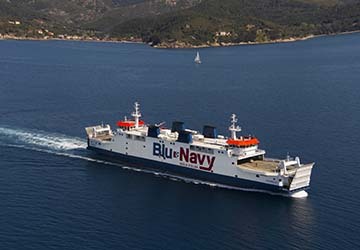 For more information, please visit our Ferries from Italy to Elba page. For more information, please visit our Ferries from Corsica to Elba page. For more information, please visit our Ferries from Pianosa Island to Elba page.